During the tour, travelers will visit and know the places, streets, buildings, landscapes, the great history of politics, society and power, and small stories of people who were and are protagonists of the Jewish experience in Rio de Janeiro. 1 A Tour with a historical perspective on Jewish immigration to Brazil and the relationship of the Jews with the Brazilian state. * The viewpoint "Mirante de Pasmado", where is the Yitzhak Rabin monument and starting the tour telling about the Jewish community in the city. * Itzhak Rabin Park, opened by Lea, his wife, with spectacular views of the beach of Botafogo and Sugar Loaf. * Lapa: the arches, Oswaldo Aranha restaurant. * Chabad Lubavitch Synagogue and Cultural Center Midrash (in Leblon). Clarification for both tours: the entrance to institutions (synagogues, schools, etc.) is subject to availability and institutional confirmation. * The Chaim Weitzman square, a public school called Anne Frank and the neighborhood of Catete, an old Jewish quarter. Note: synagogues and sites visited will vary according to customer request and / or availability of the institution. 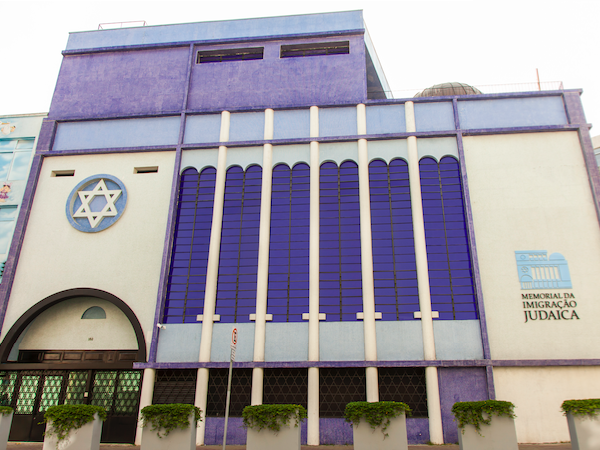 Take a comprehensive tour of the city to discover the main Jewish sites in the city of Sao Paulo. Visitors will get a chance to discover the history and Jewish life of this vibrant community. Monday through Friday: Entering to institutions. Saturday and Sunday: The entrance to institutions are subject to confirmation. Includes: Bilingual guide, entrance fees to sites visited and transportation during the tour. Pick up and drop off passengers to the hotel. Not include meals and tzedakah (donations) in Jewish sites.